Test dummy is in the head down position. Apply a force increasing gradually to (800+/-0,1kN). 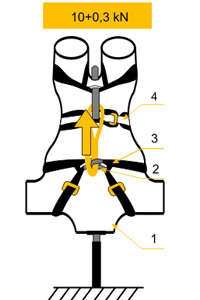 Check position of the harness on the dummy, rope attachment points shall be placed symmetrically about the plane of symmetry of the dummy. Go on with loading gradually up to 10+0,3kN over a period 2+/- 0,25min. Hold this force for 1+/-0,25min. and then release the load completely for maximum 1 min. Reapply the force and increase gradually to 10+0,3kN and hold it for 3+/-0,25min.